Salvatore Agostino, captain in the Abruzzi crime family is also on his way to see Dane Reynolds. A ruthless business man, he is fiercely loyal to his family and his men. A chance encounter brings him face to face with Emily. 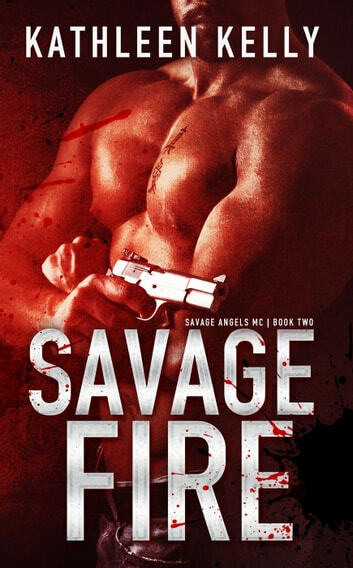 Savage Fire is book 2 in the Savage Angels MC series, and while Savage Fire can be read as a stand alone I highly recommend reading them in order. Emily has had a rough life, she blames this on her brother Dane's leaving and never coming back for her. She's on her way to confront him when the unexpected happens and stops her in her tracks. Rescued by Sal, a member of the Abruzzi crime family, unknowingly both headed for the same person but for different reasons. Sal feel a pull towards Emily, he finds himself caring for a woman for the first time. But he won't involve her in his life until he's sure she's a good fit, that she can handle his lifestyle. (Such an honest crime boss lol) I laugh but I loved Salvatore, not quite as much as I loved Dane and Jonas but he's so alpha and protective you just can't not love the guy. Savage Fire is full of action, suspense, sexual tension, hot bikers, a snake or two in the grass and romance. Another must read from Kathleen Kelly, I can't wait to see where this series goes next.